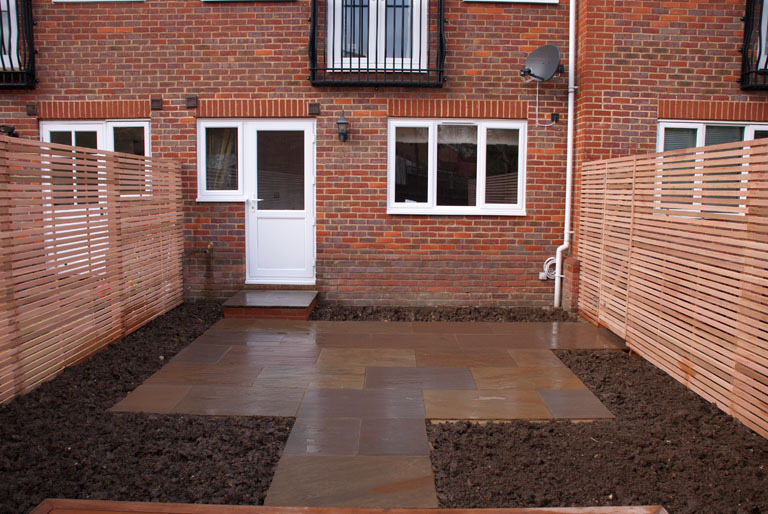 You may remember that the hard landscaping elements were completed for my project in Sutton just before Christmas. When I first went to see my clients one of the biggest challenges that faced us was the fact that they live in a mid-terrace property and the only access to the garden is through the house. Of course this is a challenge, and it can impact the build costs, but it certainly doesn’t prevent the possibility of creating a gorgeous garden! Being landlocked is a common problem in towns and cities, especially in London where most houses are terraced, but landscapers who regularly work on these sorts of properties are very used to the challenges that come with them. My house is landlocked too and the skip-load of rubble that came out of the back garden when we first moved in had to be taken through the kitchen and garage. It can be a long and boring job, but it’s certainly not impossible. If you are in the same situation and would love to make improvements to your garden then a little bit of planning can make all the difference, especially if you are thinking of doing some work inside the house as well. So often the garden is the last thing on the list, and in most cases that makes a lot of sense, but if you can time the garden project so that it fits in with any messy internal works it should make the whole experience a little bit less stressful. Depending on how well you get on with your neighbours, they may be able to help you out. The project in Sutton was made much easier because my clients were able to agree with their neighbour that the landscapers could use their side access. They’ve even agreed to a gate for occasional access in the future. The boundary fences were coming down anyway so it made complete sense. The landscaper on site was fantastic and they went the extra mile to ensure that the neighbour was happy throughout the 4 weeks they were there. It’s not always possible to make use of your neighbours of course and they may well be in the same situation as you anyway. If there is no alternative to taking the materials through the house then you will need to choose your landscaper carefully. Try and find someone who is used to working in this way and ask to speak to a couple of previous clients who were in the same situation as you. If you have been through any building project in your home then you’ll know that it can be quite stressful so you need to be sure that the people on site will keep this stress to the absolute minimum. But be brave and you will reap the rewards. A garden that you spend time in and makes you feel good will soon outweigh the short space of time in which you have to cope with the upheaval and you’ll soon be wondering why you didn’t do it sooner!